It’s the inaugural post of Things Made with Stuff from the Garden! This week, we have Too Much Eggplant and Herbs That Are Starting to Flower. Later this summer, I’ll probably be featuring What Do I Do With All This Zucchini and Holy Crap Why Did We Plant So Many Tomatoes Again. The tomato sauce for this dish doesn’t use fresh tomatoes; the first time I made it, I was trying to use up one of those huge 28 oz. cans of crushed tomatoes, and it was easy and turned out well. (For those of you who, like me, want to curse recipes that call for a 15 oz. can of crushed tomatoes because you swear they only exist in 28 oz. cans—I finally found 15 oz. cans. Furmano’s brand.) The crushed tomatoes are reduced until they’re nice and concentrated, and then vinegar, fish sauce (yes, the kind you see in lots of Thai recipes—I thought it would be easier than opening a can of anchovies…), fresh oregano, and fresh thyme get added; pasta water finishes it up so it’s spoonable but not thin. I have to tell you, I’m not an eggplant expert. This is the first year I’ve grown it, thanks to a coworker who also gardens and graciously offered to get me some Japanese varietals from a farmer she buys plants from. She told me that she often uses eggplant in pasta dishes, so that sounded like a good place to start from. 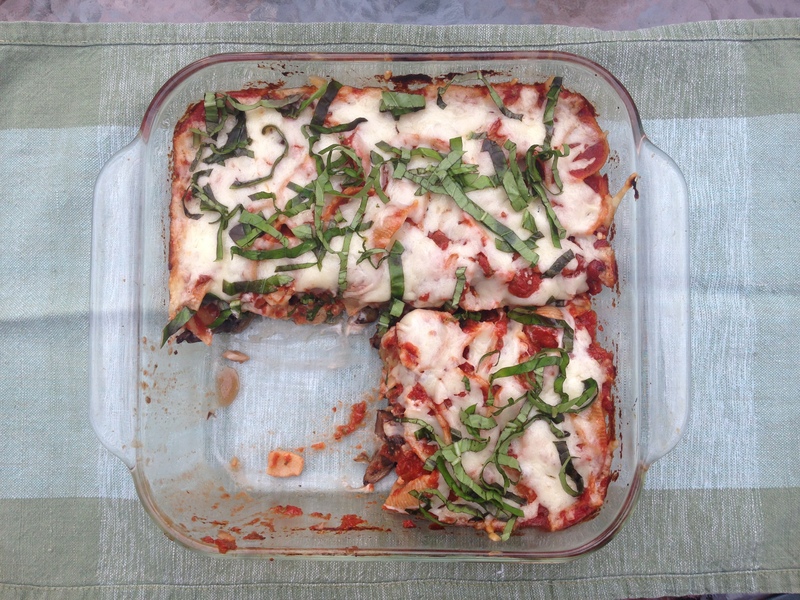 Mushrooms and eggplant pizza is a favorite of mine, so portobellos became the second veg. 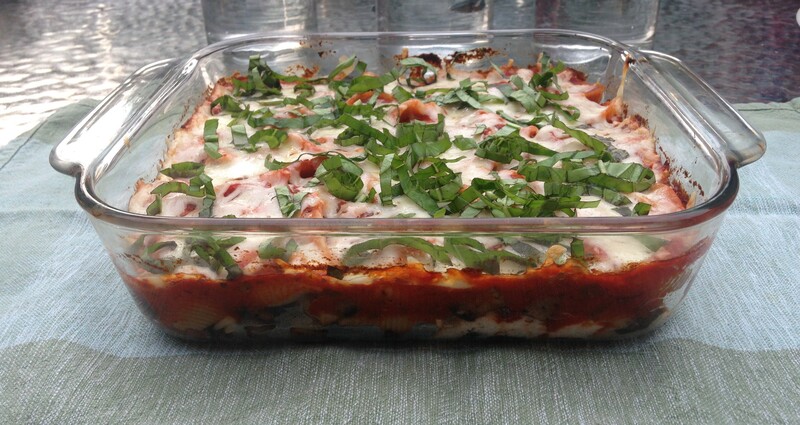 The finished product is sort of like lasagna, but without lasagna noodles: pasta is layered with veggies, cheeses, and tomato sauce, with a sprinkle of fresh basil to top it off. I am not a huge fan of ricotta cheese, so I used goat cheese. Normally I would balk at turning on the oven for a baked pasta dish in the middle of the summer, but I think this is worth the 30 minutes of oven time. It has made it into the dinner rotation twice in the past couple of weeks, and it will probably be a regular as long as the eggplant keeps coming in. Note: This isn’t 100% vegetarian because of the fish sauce. Also, I used 2 huge (6″) portobello caps, which yielded about 5 cups of chopped mushrooms. You could substitute an equivalent amount of baby bellas / creminis. Cook the pasta according to the package directions. Drain, saving a cup of the pasta water. Set aside the water and the pasta. Heat 1/2 Tbsp. of the olive oil in a saucepan over medium heat. The tomatoes are going to splatter and bubble, so go for one that has high sides. Add the can of crushed tomatoes and cook, stirring occasionally, until thick and pasty, about 25-30 minutes. (I used this time to prep the eggplant and mushrooms.) You might need to lower the heat or stir more often as the tomatoes cook down. Remove the tomatoes from heat and add the vinegar, fish sauce, oregano, thyme, and 1/2 cup of the reserved pasta water. 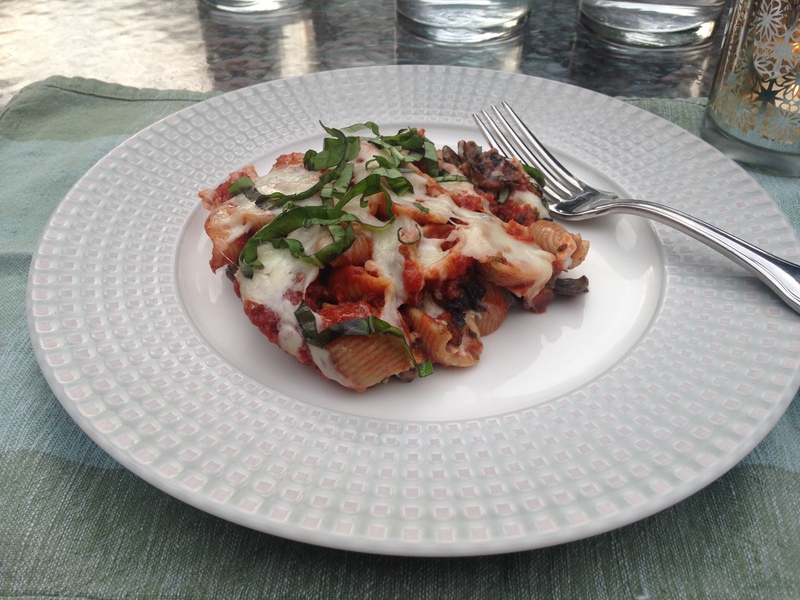 If you want the sauce thinner, add more pasta water by the tablespoon until you get the consistency you desire. I added 2 additional tablespoons. Season to taste—be careful with the salt because fish cause is salty—and set aside. Soak the eggplant in a bowl of salted water while you cook the mushrooms. Heat 1 Tbsp. of the olive oil in a 10″ sauté pan over medium heat. Remove the stems and scrape the gills from the portobello caps. Chop into 1/2″ cubes. Add the mushrooms and a healthy pinch or two of kosher salt to the pan. (They barely fit in my pan at first but shrunk down to about a cup.) Cook, stirring occasionally, until the mushrooms release their juices, about 3 minutes. Continuing sautéing until most of the juices evaporate and the mushrooms are cooked through, about 5 more minutes. Add the minced garlic and continuing cooking just until the garlic is fragrant, 30 seconds to 1 minute more. Scrape the mushrooms into a bowl and set aside. Set the same pan back over medium-high heat and add the last Tbsp. of olive oil. Remove the eggplant from the soaking water and squeeze it dry in a kitchen towel. Add the eggplant and a pinch or two of kosher salt to the pan and cook until nicely browned and completely cooked through, about 12 minutes. Think of it like making hashbrowns but with eggplant. Turn the heat down to medium if the eggplant is browning too quickly. Lightly oil an 8×8″ baking dish. Bake for about 30 minutes, or until it’s warmed through and the cheese on top is melty. Chiffonade the basil leaves and sprinkle over the top before serving.